An Eeyore or Tigger View of Life? “Each of us must make a decision, best captured in A.A. Milne’s Winnie-the-Pooh characters. 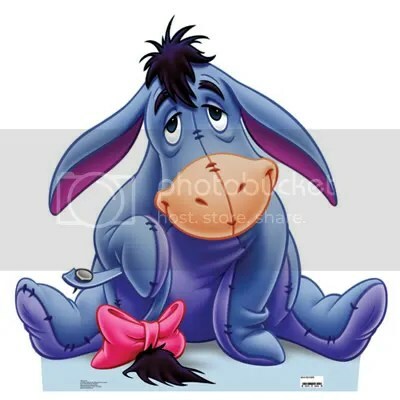 Am I a fun-loving Tigger or a sad-sack Eeyore?” So asks Randy Pausch in his Parade Magazine article (April 6, 2008). Randy is most famous for his “Last Lecture” recorded at Carnegie Mellon University and which received millions of hits on YouTube. He’s been diagnosed with pancreatic cancer and has a short time to live but is facing his short life with joy and optimism. His imagery of choosing between being an Eeyore or Tigger really impacted me. Certainly for those of us who have a strong faith in a good God who is for us, we should be a Tigger when facing life and not an Eeyore. “Whatever is true, whatever is noble, whatever is right, whatever is pure, whatever is lovely, whatever is admirable — if anything is excellent or praiseworthy — think about such things.” (Philippians 4: 8-9) God has given us the choice of how to look at the life He’s given us. 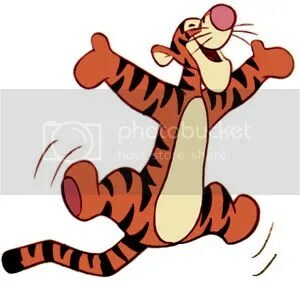 I’ve decided I want to be a Tigger! Rick then scrawled the words, “Choose the description of the Lord that helps you rest right now.” I did. Now, thank Him for being THAT for you! We See the Volcano Erupt! I was recently in Mexico, about an hour south of Mexico City, at Refuge Ranch, home to our daughter and her family. The ranch is within 25 miles of Popo the volcano. 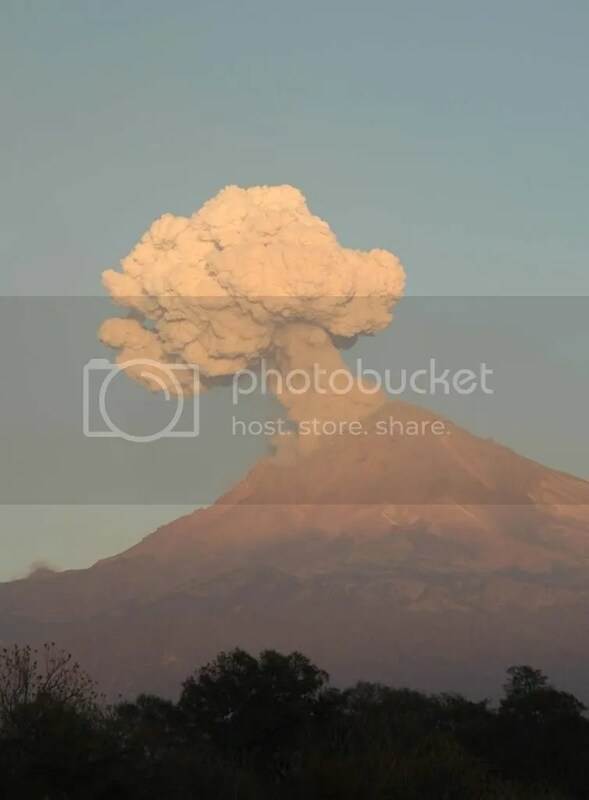 While the sun was setting it erupted in a glorious billow of white ash! What a sight! Of course, I captured it with my camera. It’s just a reminder of the awesome power there is in the universe, in this world, in a mountain. And to think God made it all and is far, far more powerful than an exhibition we see in His creation. I’m glad this God cares deeply for me. You too? This is a photo I took under an Iowa bridge. The melting snow flowed through the drain on the bridge and should have dropped into the stream below. The cold weather, however, turned it into an icicle and the strong wind blew it into the shape you see. 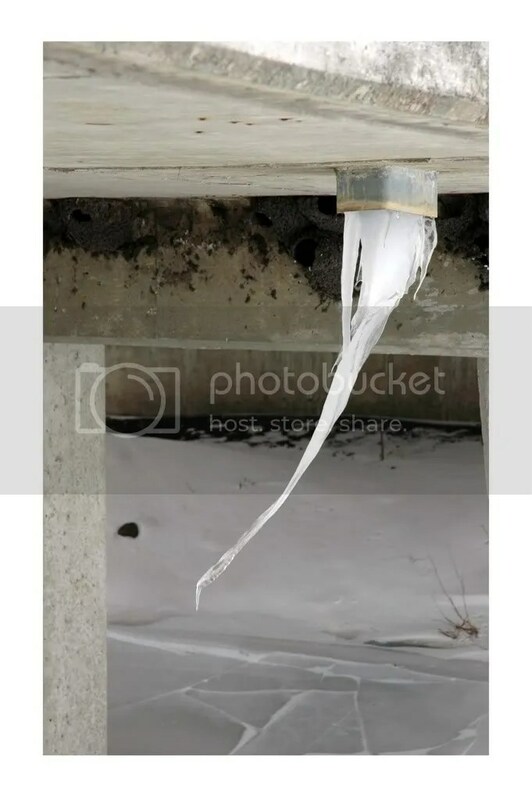 The wind curved the icicle! You can’t see the wind but you can sure feel and, as this photo demonstrates, see the results of the wind. In the Bible the Holy Spirit is portrayed as wind. Like the earthly wind the Holy Wind (Holy Spirit) can’t be seen, but you should be able to see the results of His presence in our lives. I wrote a Christmas story called The Christmas Ladder that you can view as a web page or download as a pdf file to print. 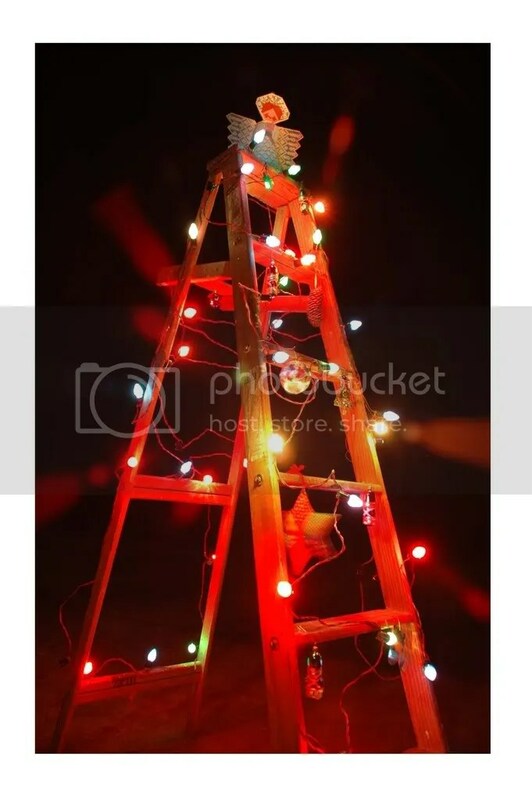 I know, it sounds strange to talk of a Christmas ladder, but I have my reasons. A ladder’s meant to take you up and down. Jesus came down so we could go up; He came down to earth so we could go up to heaven. Jesus, as the eternal Son of God, divested Himself of divine attributes. He gave up His omnipresence (being all places present) to limit himself to a cradle. He gave up omniscience (knowing all) to being a newborn that was lucky to manage moving his thumb to his mouth. He gave up omnipotence (having all power) to being a helpless babe, having to be picked up and nursed. 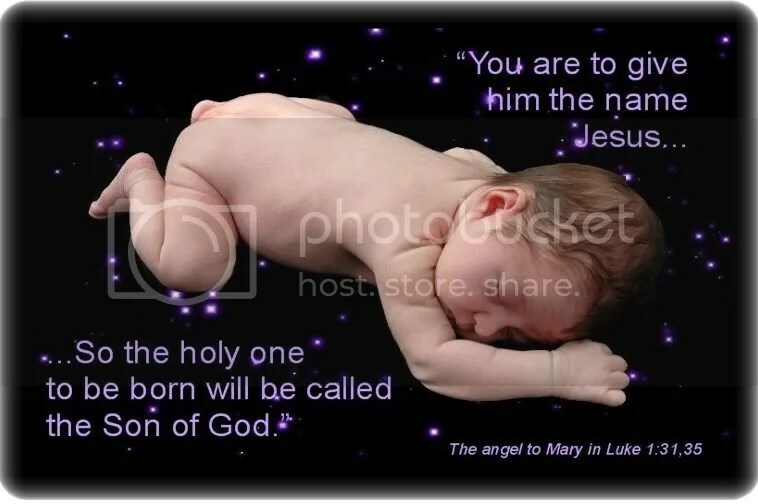 Yes, He, the eternal Son of God, humbled Himself in a remarkable way by being born as one of us. The only human being who ever asked to be born! His principle purpose in coming down to us was so that 30 years later, as a grown man, the perfect God/man, He could go up on the cross for us! There, on that cross, He died, for your sins and mine. They took Him down from the cross and laid Him down in a grave. But He didn’t stay there! He came up out of the grave and went back up to heaven where He once again has the glory due Him. Jesus’ story is a story of downs and ups, ups and downs. He came down to be with us so we could go up and be with Him. It’s the theme of The Christmas Ladder. It’s the Christmas Story. Father, Son, and Spirit enjoying perfect holy harmony. into earth’s time, the perfect time. land of Galilee, village of Nazareth, home of Mary. The angel gave explanation to the mystified Mary. the power of the Most High Father will overshadow you. Too small to see, an invisible beginning of being human. Absent from God’s heaven, present in a woman’s womb. now an embryo that has yet to grow to consciousness. forever to be different from eternity before. that we might change, becoming more like Him. Worthy of worship, love, obedience, all I have to offer. No longer my own, He lives in me. I live for Him. In a previous post we reflected on the uniqueness of humor to humans. I believe humor is tied to our spiritual nature. The humor of Christ is expressed in the accompanying charcoal artwork done by a local artist I know, Robert O’Neil. Bob is retired and now serves as a volunteer at Toledo Hospital in Toledo. You’ll find him wearing the red volunteer jacket, and a big smile — no surprise! Our son, his wife, and our grandson are visiting with us a couple of days. Of course Diann and I are having a great time with our six month old grandson, Casey. One of the fun things we do as grandpa and grandma is make Casey smile and then get him to break that smile out into laughter. While enjoying Casey laugh it occurred to me that we humans are the only creatures, as far as I know, who laugh. I find that to be a curious thought and can’t help but believe it’s tied to our spirituality, our ability to experience the transcendent, the ability to have a relationship with God. Years ago Christian author Elton Trueblood wrote a book titled The Humor of Christ. The book grew out of an experience of reading one of Jesus’ parables to his children. At one point his child laughed as Trueblood read what Jesus had said. Trueblood realized that there was, indeed, humor in some of Jesus’ stories but that we know them so well they’ve lost the humor from surprise. 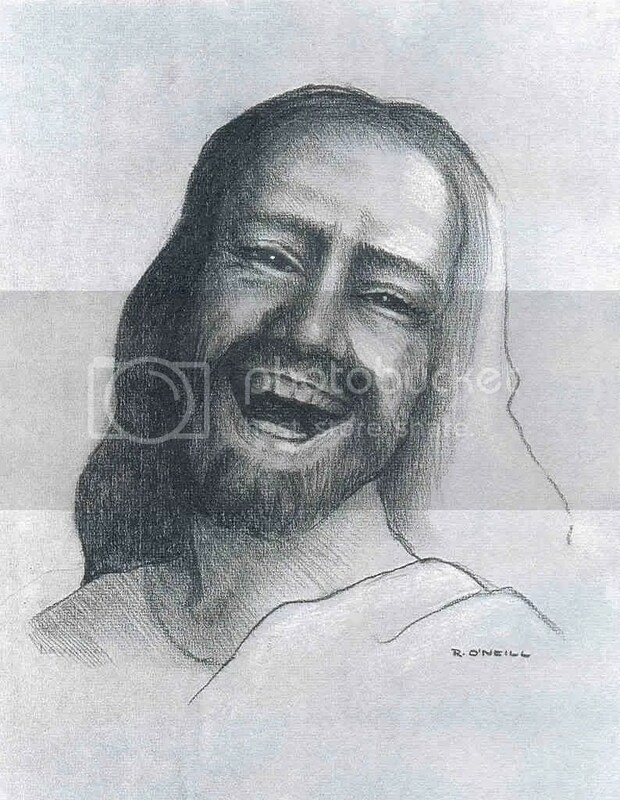 In my office I have a charcoal drawing of Christ laughing done by a man here in Toledo. He now volunteers at Toledo Hospital, and I often comment to him how I enjoy his piece of art. What do you think is the connection between humor and faith? I know, for one thing, that when we can laugh in the face of all that’s wrong in this world we are affirming the fact that evil has not gotten us completely down, that our God is still in ultimate control. Yes, people of faith should find regular reasons to laugh!